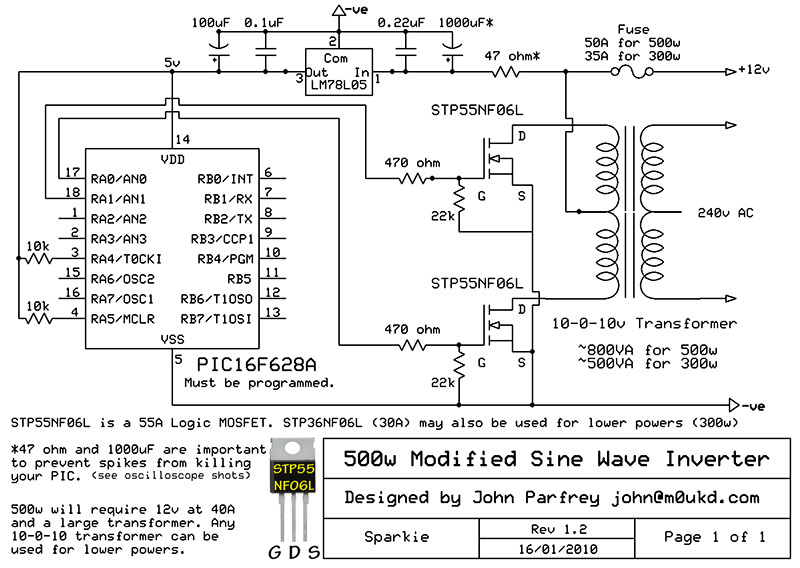 Could a sine wave generator chip be used, such as an Intersil 8038, to control the mosfets to get a pure sine wave? You could, but the MOSFET’s would no longer be acting as a switch and would have to dissipate lots of power making it highly inefficient. Thanks for answering my question. I was thinking that a high power amplifier could be modified to run on 12VDC and driving it with an 8038 sine wave generator. Alternatively, could more steps be incorporated into the pseudo sine wave so that it is closer in shape to a sine wave? You could use something simple like a PICAXE for this circuit, instead of what I used. It would make programming simpler. when I searched that I saw like it has a editor to edit or create programming for a chip, but I dont want to edit your file I am looking to build a hardware to program the Pic Ic itself to use. John – would this work at a higher switching frequency (=simple software adjustment), beyond 60 Hz? For my intended application, I’ll just rectify/filter the output (getting back to DC), so I’m curious if a higher frequency would be compatible with the circuit and transformer, possibly allowing greater power and/or reduced transformer size? Thank you! I’m sure you could build a much better design using a higher frequency and smaller cored transformers, like a switch mode power supply would. A standard iron core mains transformer is built for 50/60Hz though. 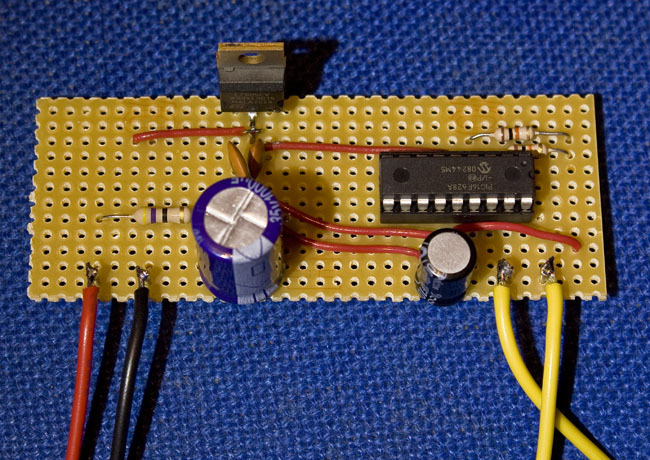 i had tried your circuit using pic controller. circuit is working but i got 4v ac as mosfet output, how to increase output. If you are testing the output of just one mosfet, you will only be seeing half of the waveform and even then its not the peak value. To test it properly, I would add a pair of 1k resistors from each drain to positive on both mosfets, then put your meter across both drains. This should give you the RMS value. Multiply that by 1.41 to give you the peak value. This should be about double of the input voltage. 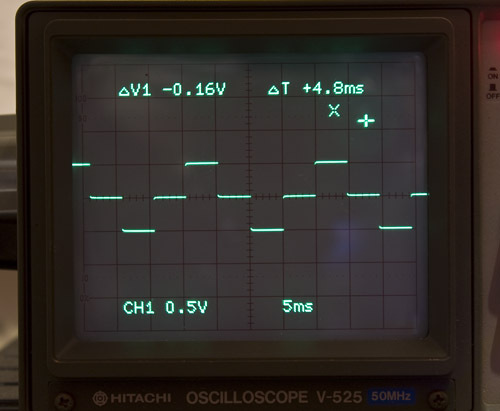 I made the circuit with the 555 and the 4017 , but I realized that the frequency that comes out of the 555 too high ( it is in the range of kHz ), while the duty cycle is good . The problem is precisely the value of the capacitor 1 nF (the one that is connected to PIN 2 and 6) which is too low . To resolve this problem use a 10 nF capacitor. it is also wise to replace the other capacitor with a 1 nF 10.
is this circuit gonna work perfectly with 555 and 4017?? It works, it’s just a fun circuit. I found a way to use a IRF3205 instead of the logic MOSFETS. I built the one with the 555 and 4017, I am getting 50% duty abut frequency on 12v transformer is 282hz 80v and I tried a 9v and I got 282hz and 172v sams duty cycle, seems i have to use a 10v transformer but why is the frequency so high? Sorry, I am not sure why! Check the 555 output and/or component values. I found the problem. I would like to try the version with the micro controller but I cannot program it I built 2 circuits to program it but none of them picked up on my laptop, I tried to use ic programmer and micro programmer. could you give me a way to program it. 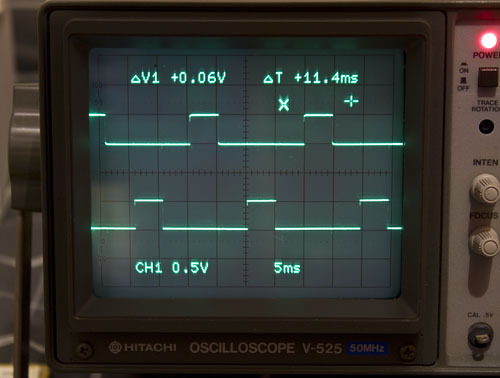 This is a Modified Square Wave>>>>>>>>>>Right???? Yes, you could call it either! I finally programmed the pic and I got the circuit working, at 12.27 volts from the battery I got 95v from my 12v transformer so I decided to plug my fan in to test it before I could even turn the fan on one of the fets blew out what caused that? I am wondering if its because the resistors at the gate of the fet are 1/4 watts. There is virtually no current at the gate, so the resistors won’t be a problem. If its a large transformer, the inrush current might be a problem. So what would I have to do in order to use a large transformer? Perhaps make sure the MOSFET’s are being switched on fully. Maybe limit the inrush current somehow. I have not had this problem, but the project was built for fun! 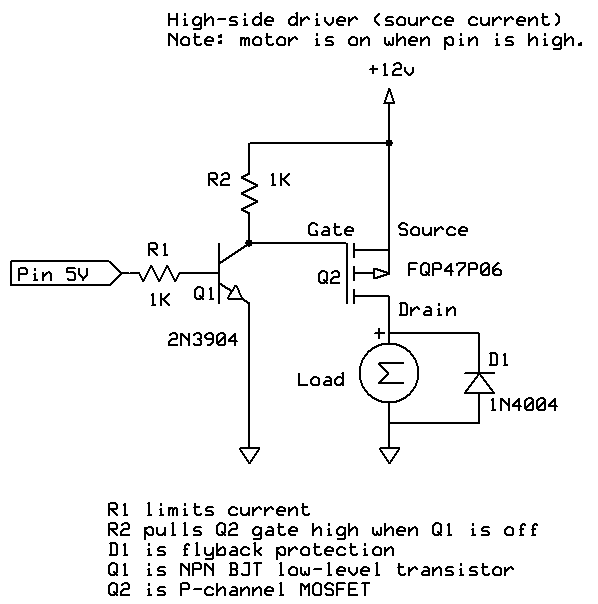 i just notice that their is no crystal oscillator in the diagram between pin 15 and 16.
do i need the pic to program first before connecting all components? does it need to connect and crystal oscillator? can i use other MOSFET’s and parallel it for high power output?? The circuit uses the PIC’s own internal clock. I would program the PIC externally before fitting into the circuit. This is an old project that was made for fun. do i need optoisolator to protect pic? I never used one, its up to you! How much would be the output voltage if the battery voltage 13.8? Or may be 14.7? as i read all the details. that you say it efficient and produce less heat and run at cool. can you design an h bridge? 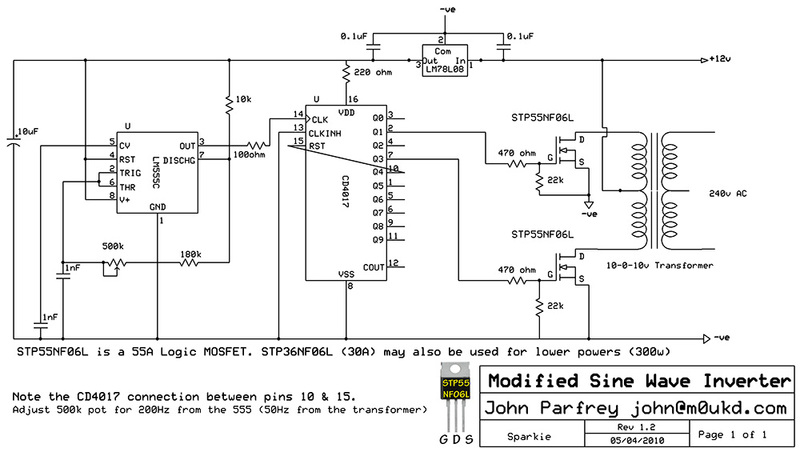 of this mosfet STP55NF06L? Yes, you could certainly adapt this into a H bridge with 4 MOSFET’s.